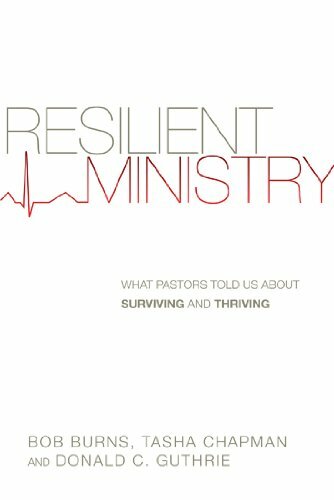 Bob Burns, Tasha D. Guthrie and Donald C. Guthrie, Resilient Ministry: What Pastors Told us about Surviving and Thriving (Downers Grove: IVP Books, 2013). ISBN: 978-0-8308-4103-5; 312pp. A guest-review by Kevin Ward. This is a book which every person working as a minister of the gospel would benefit from reading – indeed, more than reading, but also reflecting on and, in light of that, making changes to how they live and work. We are all aware that many of those who enter ministry in response to what they perceive as a life time calling drop out within a relatively short period of time. Precious few of those I trained with nearly four decades ago are still in church ministry. What kills them off is not what goes into sermons or worship services but, as the authors of this book point out, matters of life skills, behaviour patterns and character. This book not only identifies the core issues but also makes suggestions of what needs to change and how to action that. Rather than just building on anecdotal evidence or personal experience, the book is based on solid scientific research. The team created three pastoral peer groups or cohorts (who were primarily Presbyterian) who met three times a year for two years. They were interviewed to identify the ministry issues they wanted to discuss. They then read books on those subjects, listened to experts who were brought in and then discussed the issues in their groups. The discussions were recorded, transcribed and analysed. 1. Spiritual formation. Ministers can be so busy in the multiple tasks of ministry that they neglect their own spiritual wellbeing, the source from which ministry flows. They need to internalise the spiritual rhythms of reflection, worship, sabbath and prayer. 2. Self-care. The ongoing development of the whole person: physical, mental, emotional, relational. This involves a range of practical issues including identifying allies and confidants, establishing an exercise routine, planning intellectual development and holidays and creating and keeping good boundaries. 3. Emotional and cultural intelligence. These are related to being aware of oneself and also attentive to and aware of other people, places and social dynamics. Much has been written recently about the importance of emotional intelligence in leadership but the awareness of cultural intelligence, crucial in our increasingly diverse world, is only just emerging. 4. Marriage and family. Unlike many jobs ministers are never really ‘off the clock’, and so the demands of ministry can constantly intrude on marriage and family time. It is, then, critical to be intentional about giving focussed uninterrupted time to spouse and children. The significance of the contribution of the spouse to a minister’s resilience in ministry came through again and again. 5. Leadership and management. I found these chapters full of good insight and found helpful the way they talked about these as the ‘poetic’ and the ‘plumbing’ side of leadership, both of which are essential to good and resilient ministry. The management side can be found addressed in many books but the poetic side of leadership is much more intuitive and harder to explain and there are some helpful concepts here. As well as having lots of good information the book has questions for personal evaluation and reflection throughout, as well as suggestions for further reading and exploring through media. This is an area I have taught in for the past 15 years or so, and this book is as a helpful as any I have come across. It is both informed and practical. As well as its personal use for ministers, it would be ideal for a group of ministers to read and discuss together and perhaps also to work through with the lay leadership in their church. I certainly intend using it as an important text for my students.